Join Jewish Care’s Star Club Monthly Giving program and make a difference today...and every day! 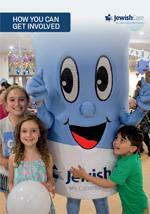 One of the greatest ways you can make a difference and support Jewish Care is through monthly giving. When you become a monthly donor, you gain the benefit of knowing that each day, your donation is working hard to provide ongoing assistance to individuals and families in urgent need in our community. Don't delay and sign up today!